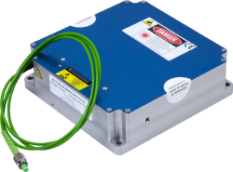 The KARTENN is a compact pulsed fibre laser delivering up to 5 W average output power and up to 100 µJ per pulse in standard versions or up to 50 µJ per pulse in its polarisation maintaining versions, through a collimated output beam. The design and configuration of this laser renders it unique and reliable. The atented “Injection Technology” allows highly reliable broad area laser diode pumps to be used, for cost-effective and maintenance-free operation. The KARTENN is the ideal solution for a broad range of industrial and scientific applications.